Each child receives a Take-Home card that has the same picture as one of the large Bible Visuals used during the teaching time. A condensed version of the story is printed on the back. 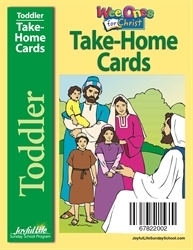 Parents can use the card to reinforce at home what was taught in Sunday school. *29 cards (24 weekly lessons plus 4 Christmas cards and 1 Easter card) *4 1/2" x 5 1/2" *Order one set per child.